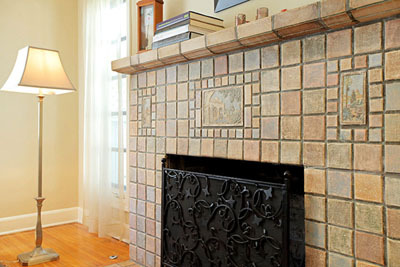 FIREPLACE in home on Sycamore Ave. features Batchelder tiles. Photo by Andrew Burk. “A fireplace is not a luxury; it is a necessity—because it adds to the joy and beauty of living,” said Ernest Batchelder. Batchelder began making tiles from a shack in his backyard in 1911. A year later, Pasadena architects Charles and Henry Greene were using his tiles in a house in 1912. In the teens, Batchelder drew upon Japanese, Scandinavian, Byzantine and other medieval sources for his designs. The color of his tiles was usually a dark brown with a background tinged in a blue-green that became his trademark. He did not like the high glazes that the other tile makers featured. His muted and often mottled colors and soft matte finishes fit well into the Arts and Crafts houses and bungalows of the time. Batchelder tiles became extremely popular, so much so that he moved his tileworks from his backyard to a larger shop on what was then called Broadway, now Arroyo Parkway, in Pasadena, where five kilns allowed greater production. By 1920, his business was doing so well that he bought an old barn on Artesian St. near the railroad marshalling yards in Los Angeles. Here production increased to the point that he needed to expand the barn significantly. In 1925 he employed 175 workers who kept his 11 kilns busy. He had become one of the major tile producers in the United States. His tiles appeared in the bathrooms, kitchens, breakfast rooms, swimming pools, fountains and especially on the fireplaces of Southern California houses. The architects of industrial and commercial buildings, such as the Fine Arts building in downtown Los Angeles, used Batchelder tile in designing their lobbies and other major spaces. Batchelder tiles can be found from coast to coast. The care that Batchelder lavished on his fireplaces suggests that producing the tiles was not inexpensive, a factor that would prevent his works from surviving economic downturns. The Great Depression of the 1930s wiped out Batchelder’s tileworks as it did those of many of his competitors. He was forced to retire, but between 1912 and 1932 he had built up a body of work that continues to enhance American buildings constructed during that period.